This week the University of Warwick hosted the launch event for the new Zeeman Institute for Systems Biology and Infectious Disease Epidemiology Research (SBIDER). Guest speakers flew in from Germany, France and even the US to give thought inspiring talks from their various fields of Biology, Epidemiolgy and Mathematics. Edward Hill joined the speakers with a short talk at the end of the first day. Last week the Ambleside campus of the University of Cumbria hosted the inaugural Conference of Infectious Disease Dynamics. Quick paced sessions of short talks allowed 40 participants to show off their hard work on a variety of diseases and methodologies. 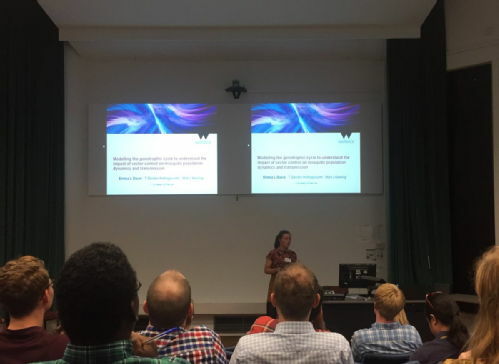 Our own Emma Davis, Joe Hilton, Sophie Meakin, Ben Atkins and Liz Buckingham-Jeffery gave talks while Katherine Broadfoot, Christopher Davis and Cameron Lack presented posters. Congratulations to Ed on recently submitting his PhD thesis, titled "Mathematical modelling approaches for spreading processes: zoonotic influenza and social contagion", and subsequently completing his viva. Ed has gone onto a post-doc position in the Zeeman Institute: Systems Biology & Infectious Disease Epidemiology Research (SBIDER) at the Univeristy of Warwick, working with Professor Matt Keeling. The project is on mathematical modelling of seasonal influenza to test existing and novel vaccination strategies, and using economic models to assess cost-effectiveness, to inform government policy. Ben, Katherine, Chris, Cameron and Sophie attended this year's annual postgraduate poster competition. Postgraduates from varying disciplines around campus come together to present their work to a non-specialist audience. 24 judges from across the faculties assessed the posters on their ability to be understood by those outside of the field. Sophie impressed the judges winning both the science and the best overall awards, while Cameron took home a runner up award. After attending Adair Richard's excellent Science Communication, the Three Minute Thesis (3MT) competition seemed the natural next step. I submitted my video entry and was pleased to be selected as one of the nine finalists. My talk was on "How far do we need to spray households to control a neglected tropical disease?". The whole process made me look at my research from the aspect of a non-expert who is likely to ask the question "So what? "; so my talk introduced my motivation and research purpose before discussing the results and their value. The 3MT was a great opportunity to practise public speaking to a large audience. The majority of the audience were from the university community but with a wide range of specialities, therefore I couldn't assume knowledge of my subject area. I'd definitely recommend entering the competition to others in 2018 as one learns so much in the preparation and the training day if you get selected. It's a competition with one winner but I know I made such a big improvement from the online entry I first submitted to my presentation in the final. 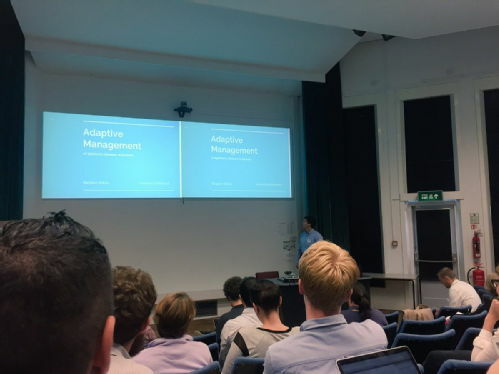 Ben, Alex, Liz, Chris, Joe, Cameron and Sophie travelled to Bath for the conference on "Developing efficient methodologies for modelling stochastic dynamical systems in biology." An interesting programme covered topics from non-spatial models to spatio-temporal models, as well as multiscale and hybrid methods. Joe and Sophie presented posters garnering much interest from other attendees. The Epidemiology Research Group has been created to give PhD students working on problems in Epidemiology in the MathSys CDT and Complexity Science centre at Warwick an opportunity to regularly meet and cover a wide range of topics. We are currently meeting in D1.07 on Thursdays at 10am, please get in touch at k.a.broadfoot@warwick.ac.uk if you'd like to join us or have any questions!